This post is occasioned by a happy discovery, or rather rediscovery, in the field of online liturgical resources. 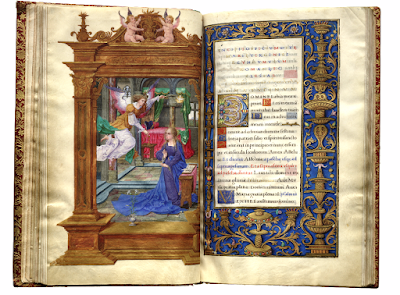 In 1991, a Danish fellow named Eric Drigsdahl establish a small private research institute for the study of Books of Hours and related materials, the Center for Håndskriftstudier i Danmark. (Center for Manuscript Studies in Denmark, abbrev. CHD). He created a website with lots of useful information about all kinds of Books of Hours; one of the pages, for example, catalogs all of the variants of the Little Office of the Virgin according to dozens of medieval Uses. When Mr Drigsdahl passed away a few years ago, the website went offline, but it has recently been rescued and revived. Thus far, I have not found any indication of whether the new owners of the site plan on adding to it; the new host site does not seem to even have a link to CHD. Mr Drigsdahl himself was constantly adding new material; it is to be hoped that those who rescued the site from oblivion will be able to continue to build on his interesting work. 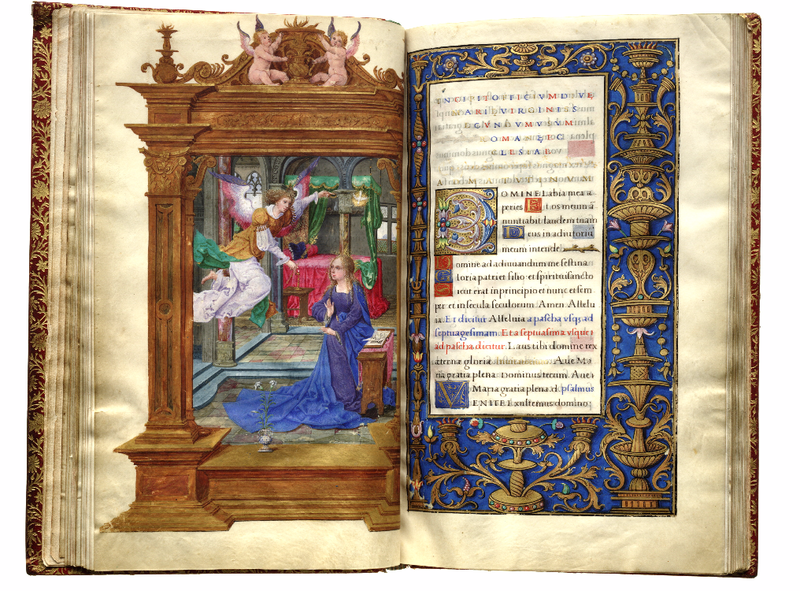 While we’re on the topic, here are examples of two complete Books of Hours available for consultation on the web, examples which I have chosen because they are on pretty much opposite ends of the spectrum artistically. One is known as the Maastricht Hours, a manuscript made in Liège in the first quarter of the 14th century, now kept at the British Library. 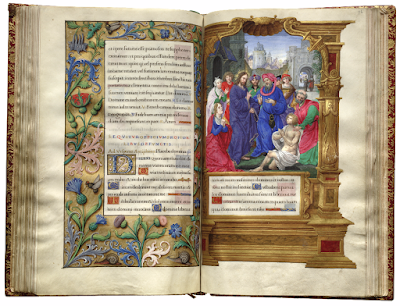 It contains the standard liturgical texts which are the basis of all Books of Hours: a liturgical calendar, the Little Office of the Virgin, according to the Use of Maastricht, which is quite different from the Roman Use, as well as the Gradual and Penitential Psalms, and the Office of the Dead (also different from the Roman Use in several respects.) The last several pages contain a long series of invocations to the Virgin in medieval French, each beginning with the word Ave.
Folio 256r of the Maastricht Hours (Stowe ms 17, British Library) - the beginning of the invocations in medieval French. Each page can be seen in a very high resolution scan, and by rolling the wheel of your mouse, you can get a close-up view of the details. This manuscript is quite famous among scholars in the field because of its decorations, among which devotional images such as the one seen above are very much the minority. Literally every page has something in the margins, which are quite wide, indicating a commission for a wealthy person who could afford to pay for extra paper. These marginalia form an incredibly rich panoply of persons performing every kind of activity, animals both real and imaginary, and grotesques as clever as they are bizarre. Many of these spring out of the decorations added to the large letters, but the majority have no connection to the text. 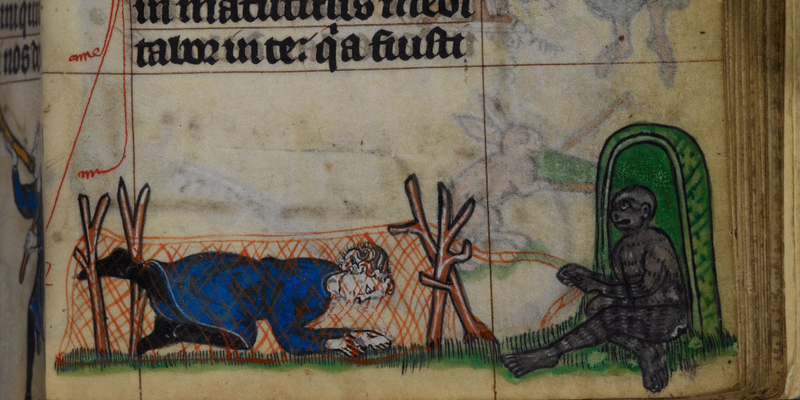 Like many medieval people, the illustrator seems to have been especially fascinated by monkeys, who figure prominently among the many images of animals behaving like humans, such as this one who has trapped a person in a net. It is pleasant to imagine the original owner using this not only as a prayer book, but also to entertain her children. 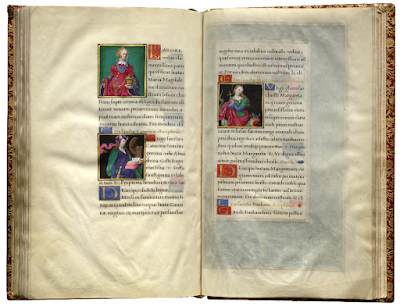 From the height of the Renaissance comes this manuscript in the Library of Congress, Rosenwald ms. 10, a Book of Hours according to the Use of Rome made in 1524; the exact provenance is apparently unknown, perhaps Touraine in France. By this period, the “standard” repertoire of material in Books of Hours had grown considerably, so after the calendar we find four Gospels, one from each Evangelist: the Prologue of St John (1, 1-14), and the Gospels of the Annunciation (Luke 1, 26-38), Epiphany (Matthew 2, 1-12) and Ascension (Mark 16, 14-20). There follow the Passion according to St John (chapters 18 and 19), the Stabat Mater, the long prayer Obsecro te, Domina, very popular in that era, then finally the Hours of the Virgin according to the Use of Rome. In accord with the typical practice, each Hour begins with an illustration, showing an episode from the life of the Virgin. The Annunciation, and the beginning of Matins from the Hours of the Virgin; Library of Congress, Rosenwald ms 10. After the Hours of the Virgin there are two very brief offices called the Hours of the Cross and of the Holy Spirit, in which each Hour consists only of a hymn, a versicle with its response, and a prayer. After these are the Penitential Psalms, the Litany of the Saints and the Office of the Dead. The last thirty pages are occupied by the “Suffrages.” various prayers to the Trinity, to the Virgin, and commemorations of the Saints, the latter consisting generally of an antiphon, versicle and prayer from the Divine Office. 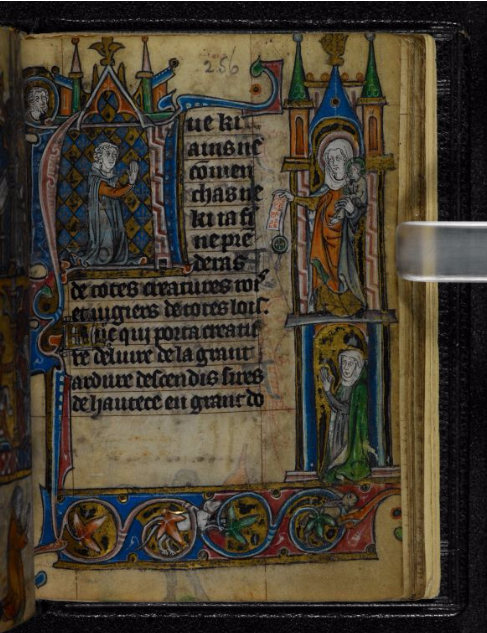 The Suffrages are very often the place where the illustrator of a Book of Hours would show off his talents, creating different set of decoration for each of many Saints; here the portraits are smaller than in many other such manuscripts, but still very fine for it. The Suffrages of Ss Mary Magdalene (text begins on previous page), Catherine and Margaret. There are far fewer illustrations here than in the Maastricht Hours, but they are all of the highest quality, showing a strong Italianate and Renaissance sensibility. All the images are of sacred subject matter, and the decorative borders, also of the highest quality, are either floral or architectural. The manuscript can be downloaded for free in pdf format.